Synopsis from hardcover book, 368 pages, copyright 2018 and published by HarperCollins. I have not heard of Thrity Umrigar before, although she is author of nine books, which includes a memoir and a children’s book. 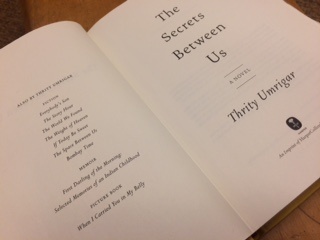 The Secrets Between Us is my first book by her and what a wonderful introduction! The Secrets Between Us is the sequel to The Space Between Us, and you don’t have to read the first book to enjoy the sequel. I read it as a stand alone and it worked beautifully. There’s nothing like reading a touching tragic poverty story set in India to make you feel so appreciative of your situation! I really enjoyed this book and it stayed with me long after I finished it. The heart of story is about the relationship between two very poor women in Mumbai, India and how they became friends, but it is the setting that helps create the layers of complexity in the story. Thrity Umrigar is a wonderful writer! She pulled me in right away from page one. I kept on wanting to read about the lives of the characters, and every time I put it down, I was thinking about it. Although this is a character driven novel, I was turning the pages because it was so compelling. Umrigar rich descriptions of Bhima’s and Parvati’s life was remarkable. She sheds light on the issues that each woman face, being low on the caste system. The daily life in the slums of Mumbai is an eye opener. Author vividly brings to life the poverty and the real struggles of the women involved. Mumbai is changing and the fast pace of the change exacerbates the poverty stricken poor even more- the poor are still very poor. What I enjoyed the most is the way the author’s writing makes you feel and taste the poverty. It is there in the forefront along with Bhima’s and Parvati’s story. The story line’s bleak setting may put you off but the richness and complexities of the characters will entice you to journey with them. Umrigar’s greatest asset is the wonderful characters. The friendship between Parvati and Bhima is awesome. Parvati story was so sad yet so believable. She was sold when she was young because the family was starving. Her family lived on subsistence farming, where they grow enough food for the family. The drought came and it meant that they weren’t able to grow their food and didn’t have any other means of supporting themselves. Parvati’s story and her history after she was sold came out in bits. As her friendship with Bhima grew, Parvati was able to divulge her secrets. Parvati’s disfigurement and her crotchety attitude does well in hiding the person she is inside. You’ll end up loving her just like Bhima. Her strength and resilience is what I admire about her. Bhima, like Parvati, has endured hardship and mistreatment in her life. Both characters accept what they have been dealt with but strive for a better life. For Bhima, she works 2 jobs so she can provide for her granddaughter and keep her in her studies. She wants Maya to have the opportunities that an education will bring and to rise out of the poverty that she was born into. Her determination to do what she must for her loved one is a quality I love about her. Bhima’s granddaughter Maya, along with Chitra and Sunita are also a wonderful addition to the cast of characters. Chitra and Sunita are a lesbian couple who show Bhima kindness and respect that she never had before. Bhima’s family and friends become a sisterhood that support each other emotionally and financially and reveal what it really means to be a friend. I loved the ending. It really pulls the story together and gives the reader a feeling of hope. I was hopeful for Maya’s future. All the sacrifices that Bhima had made was worth it and it’s good to feel an upbeat hopeful message. I really didn’t want the book to end but the was ending bitter sweet and it was uplifting as well. 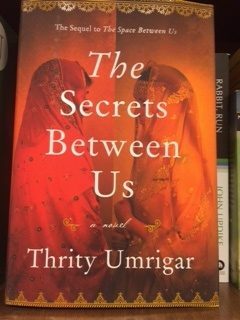 I enjoyed The Secrets Between Us by Thrity Umrigar immensely. I loved the journey of Bhima’s and Parvati’s friendship as their relationship bloomed. Their struggle to survive in an unrelenting cycle of poverty and how they came together in a business partnership gave hope as they overcame the obstacles and empowered themselves. It is very emotive and will stay with you long after the book is finished. I highly recommend this book! It’s a MUST read for anyone who enjoys a well written story with fantastic characters. Get your copy, or listen to it for free with a trial of Audible. (You can listen to an Audible sample too). Belong to a book club? Check out our book club discussion question for The Secrets Between Us. The secrets between us sounds like a great read. The Secrets Between Us was a fantastic read. I loved it so much that I am now reading the first book! It’s okay to read it out of order though… it’s like reading a regular book with the flashback parts. The Secrets Between Us does have a group of strong women characters. I think Umrigar is a very talented storyteller. Her characters all interesting and strong even though the have to battle the uphill grind of their oppression.